This book is by far my favorite book on Elizabeth! I am so excited for this giveaway as I've wanted to add this book to my collection for some time! So happy to hear it's being released again! Great giveaway! I would love to read this one! I'd love a chance to win this book! Please enter me into the drawing! You have been having some awesome giveaways lately. I have been wanting to read this one. I'd love the chance to win this book! I am fascinated by Elizabeth, well, all the Tudors really! Thanks for the awesome giveaway!! Amy, I,too, have heard that this is the absolute best HF about Elizabeth. Thanks for the giveaway. Sounds interesting! I'd give it a read! Oh, I wanted this from Sourcebooks, but I already had my quota. Would love to win a copy of my fav queen, also. I'm a follower! This book looks awesome. I would love to be entered and even more to win!!! I've been wanting to read this for some time! Please, enter me! Please enter me.. thank you. This sounds like a book worth reading! How exciting, oh please enter me in the giveaway! Thanks Amy! Ooh, please enter me! Somehow I've missed this one! I would like to learn more about Elizabeth I. As with most of the English monarchs, one hears the names constantly, but unless you have studied them, you don't understand completely their significance within history or the story you are reading. I am a follower and would love to enter. Thanks for the giveaway! I have heard of the book and have been looking for it for quite a while at second-hand bookstores, chrurch bazaars etc. without any luck. Great that it is going to be re-issued but heaven knows when that will get over here (South Africa) , if ever. So please enter me and I shall be holding thumbs. This looks great, I'd love to be entered! Why yes please! And if I don't win...yea Sourcebooks! QE1 is also my favourite Queen. I would love to win this book. Thanks fr making the giveaway international. 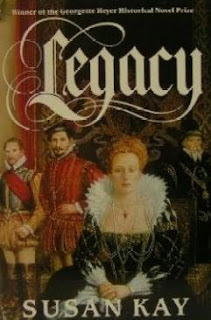 I just read yesterday on Melanie's blog, Kill them all, God will know his own, that this was the best Elizabeth I novel she has ever read. Elizabeth I is my most favorite historical figure! Thanks so much for this awesome giveaway! THANK YOU, Amy for the giveaway. Wow, what luck you had. Two copies at your library sale! None of my libraries have this book and it is really hard to find. Although, I just saw that Sourcebooks in re-releasing it in July. I have wanted this book for a very long time, so please enter me. Please enter me for this giveaway which is as usual wonderful. I am a follower. I adore reading about Elizabeth I, she is such an intriguing person in history. I am indeed a follower. Thank you for giving me this wonderful chance. This book seems to be on everyone's favorites list. Please enter me! I have seen this book on many lists, and would love a chance to read it. I would love this book I don't care if its used I would read it on toilet paper if I won. I would love to be entered to win this book and I'm not the slightest bit bothered that it is used. Thanks for the giveaway. I'm a follower. Please count me in, it sounds fantastic. I'm a follower!